Each Windsor chair is crafted from four types of wood: tulip poplar for one board chair seats; white ash for spindles; maple for legs and stretchers; and oak for bendings. 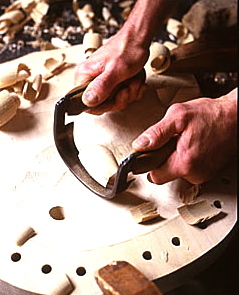 Inherent ability combined with experience and dedication provide skill and patience as Grell uses a drawknife to shape a Windsor comb. 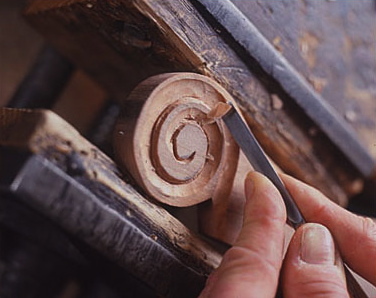 Using a chisel and mallet, Grell carves spiraled ears in the wood he hand selects for the combs and Fan-backs on his Windsors. 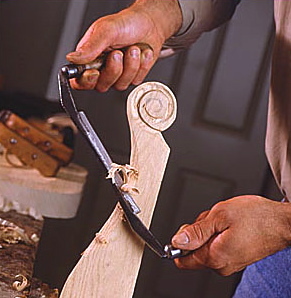 Since 1973, Richard Grell has hand-carved every Windsor chair seat using this self-made tool called an inshave. 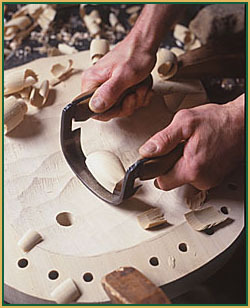 After steaming the hand-shaped piece of oak, Grell bends the bow for the back of a Windsor armchair. 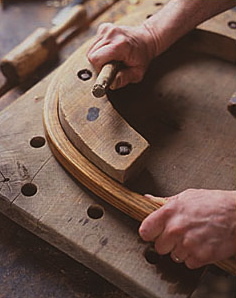 To insure the strength of each Windsor chair, Grell hand selects perfectly straight-grained boards to create the spindles, bows, combs, legs, and stretchers. 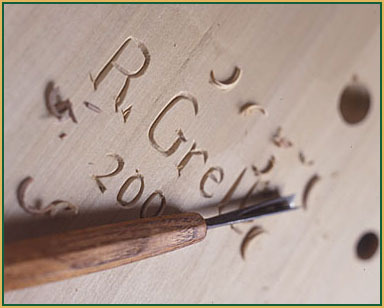 The hallmark of each Grell Windsor is his hand-carved signature and the year on the underside of each seat crafted from a single piece (one board) of poplar.